Skier's Right of Toilet Bowl. Pioneer Ridge. 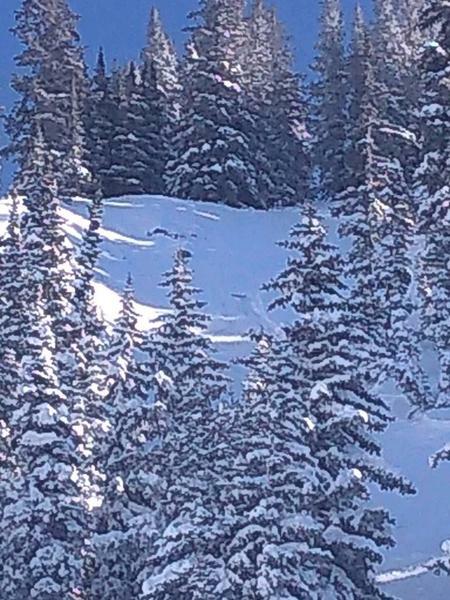 2 other skiers and I had made 3 pervious descents off Pioneer Ridge (Skiers left of Corner 3, V Tree, Corner 4). We had ski cut previous start zones while only observing surface sluff running. 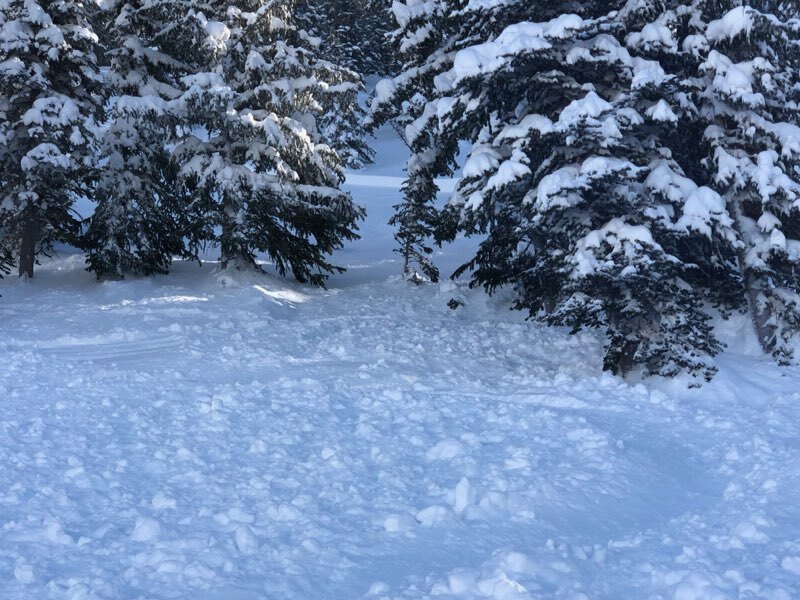 Our 4th run of the day at 2:15PM was Skier’s right of “Toilet Bowl.” We descended off Pioneer Ridge and staged in trees around a short chute above a bowl which opened to skier’s right of the chute. One of my partners ski cut the middle part of this chute. We observed surface sluffing which we allowed to run full track (300 feet?) thru the bowl. 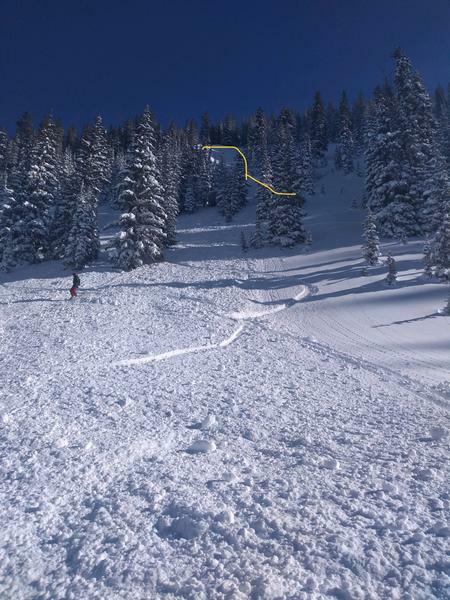 I had discussed putting in a second lower ski cut to trees below my partner now on the left side of the chute. Based on our 3 previous runs of similar aspect and pitch I opted to drop in without the second ski cut. I allowed the possible false negatives of our previous lines to cloud my judgment, in hindsight. I made two turns, the second of which brought me out of the chute and into the apron/bowl which opened up to my right. My partner on the left observed the avalanche and shouted as I saw the initial flank fractures/failures below me in the fall line to my left. The slide propagated around and above me for 80-100 feet total, the bulk of it to my left was estimated to be a foot deep. 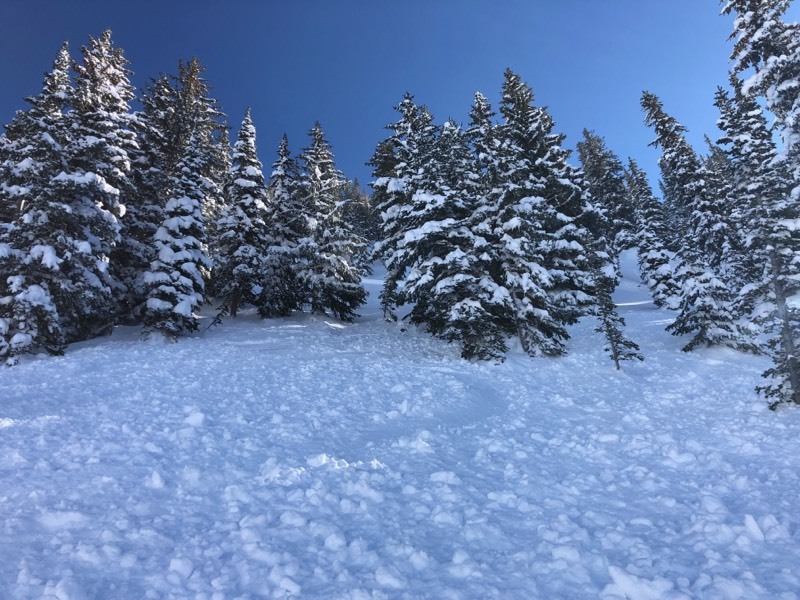 I attempted to ski to and self-arrest on a stand of trees to my left. I made it and was able to get a hand onto them. 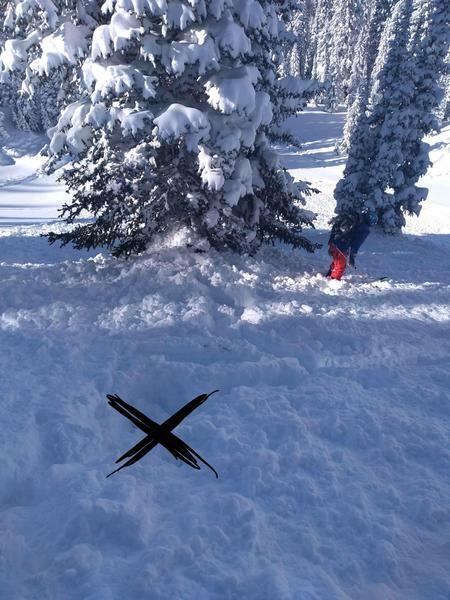 I felt moving snow pulling the back of my skis downslope and was unable to maintain my grip on the tree. I attempted to deploy my airbag following losing my grip on the tree at the top. Mittens (I usually wear gloves), snow, and the violent thrashing prevented me from deploying the bag. I alternated between attempts to deploy it and fighting like hell to swim to the surface. I was carried 600-700 feet before I stopped. Avalanche debris continued past me and ran for about 900 feet total from the crown. Both partners report initially seeing the slide and my attempting to self-arrest on the tree. I was flushed through a stand of trees 200-300 feet below them where they lost visual contact. I was able to establish verbal contact with them prior to their descent. My guardian angel must have sat on my shoulder and cloaked me in comfort, because I arrived unscathed, head up, on-top of the pack 10 feet above a large pine trees with disturbingly deep pile of avalanche debris at its base. They reported that the bed surface was “hard” and “extremely slick.” They described it as nearly impossible to turn on. 1) I had identified a possible second ski cut as an option but decided against it based on previously observed stability. We had skied similar pitches that day, but this was more open then everything other than V-tree. I allowed my previous runs of the day to lull me into a false sense of security, which is a classic thinking heuristics error. This ski-cut might have triggered the slide and placed me onto an island of safety. My only cost would have been giving up 2 turns, and potentially sluffing more snow down the slope. That is a cost I should be willing to pay each and every time. 2) I was unable to deploy my airbag. I should have done so while attempted to reach the trees. This was the last time I was upright and unencumbered by the violence of the avalanche. I am fortunate in this case that deploying the bag was unnecessary to prevent burial. Still it might have righted me and oriented me head up during the slide. 3) I am a very experienced backcountry skier, as is the partner who placed the ski cut. I have 12 years of backcountry travel experience, and Avalanche 1 and 2 certifications. The ski-cutter probably has double that experience. My 3rd partner has a few years experience and Ava 1. I offer this statement in an acknowledgement that if this kind of event can happen to us it can easily happen to other riders. Brighton's backcountry gets heavy traffic, but can be a very dangerous place. I took solace that such a terrifying experience was happening while I was skiing with trusted, knowledgeable, and experienced partners. Photo 1) Start zone of the slide.